Photographs of rental items are representative of that item. An item may be available in various sizes and colors yet a particular color may not be available in all sizes. Please call for quantity and size availability. As time permits, more photographs may be added but in the meantime we cannot provide additional photographs. Prices shown are for a 2-night rental. See our Rental Policies and How To Rent pages for more information. #S0040. Soft beret; colorful artist’s smock; large soft Byron tie. Rental Item. $45.50 each. #S0100. In red. Shako; colored jacket with gold or silver buttons; matching or coordinated uniform trousers; white gloves. Rental Item. $84.50 each. #S0150. In maroon with metallic gold trim. Shako; colored jacket with gold or silver buttons; matching or coordinated uniform trousers; white gloves. $84.50 each. #S0190. Navy uniform hat; high buttoning navy coat with red trim; navy trousers with red side stripe. Rental Item. $84.50 each. #S0192. Navy bonnet with red ribbon trim; navy jacket with red trim; white blouse; navy skirt. Rental Item. $84.50 each. #P0020. 1950-1960s-style: Colored smock or cover-up; pastel uniform dress, or day dress, or skirt, pants and blouse. Rental Item. $54.50 each. #P0030. Pill box hat; red uniform jacket with yellow and brass buttons; uniform trousers with contrasting side stripe; white gloves. Rental Item. $64.50 each. #P0031. Pill box hat; black uniform jacket with red and gold trim; black trousers with gold piping; white gloves. Optional shirt and bow tie. Rental Item. $64.50 each. #P0032. Pill box hat; uniform coat; contrasting or coordinated trousers; gloves. Rental Item. $64.50 each. #P0040. Wing collared shirt; bow tie; gray vest; cutaway coat; dark dress trousers. Optional studs, suspenders and cuff links. Rental Item. $94.50 each. Uniform hat with visor; coat; trousers or riding breeches and black leather puttees; belt; black leather gauntlet gloves. Optional white shirt and black tie. #P0062. In black. Rental Item. $84.50 each. #P0064. In gray. Rental Item. $84.50 each. #F5202. Riding boots instead of puttees. Rental Item. $21.50 per pair. #P0080. In white. Toque (chef’s hat); uniform coat; trousers; half or bib apron; colored neck scarf. Rental Item. $54.50 each. #P0090. Cap; collarless shirt or long sleeved underwear top; vest; somewhat distressed tail coat; trousers; gloves; scarf. Rental Item. $65.50 each. #S0255. 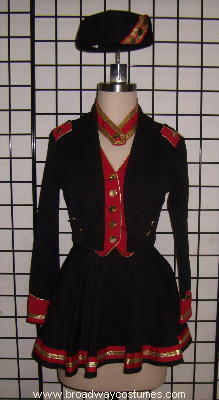 Pill box hat; black uniform jacket with red trim and gold buttons; matching skirt; dance trunks; gloves. Rental Item. $64.50 each. #C5325. Cigarette tray. Rental Item. $21.50 each. #S0256. Pill box hat; blouse or uniform jacket; skirt, tap pants or trousers; gloves. Rental Item. $64.50 each. #S0420. White cap with visor; white or striped shirt or white jacket; white trousers. Rental Item. $54.50 each. #P0345. White uniform visored cap; white, short Eaton-style jacket, shirt and trousers; black tie. Rental Item. $54.50 each. #P0130. In blue-gray or brown. Hat with visor; shirt; tie; jacket; uniform trousers. Rental Item. $64.50 each. #S0440. Beret or soft cap; satin or blouse sleeved shirt; ascot; riding breeches; boot tops. Rental Item. $64.50 each. #F5202. Riding boots instead of boot tops. $21.50 per pair. #R5020. Riding crop. $5.50 each. #P0160. Uniform cap with visor; shirt; bow or four-in-hand tie; uniform coat; uniform trousers; white gloves. Rental Item. $84.50 each. #S0460. Black or white faux fur busby; uniform coat with brass or silver buttons or satin blouse sleeved shirt; uniform trousers; white gloves. Rental Item. $84.50 each. #P0190. Soft work cap or straw hat; plaid flannel shirt or top of long underwear; bib overalls; bandanna handkerchief. Rental Item. $54.50 each. #P0300A. In light blue: Domed uniform helmet with emblem; long dark navy blue single breasted, Nehru collared, Prince Albert-cut coat; matching trousers; white gloves; belt and night stick. Rental Item. $84.50 each. #C5047. Bobby non-rain cape. Rental Item. $25.50 each. #P0300B. In dark blue: Domed uniform helmet with emblem; long dark navy blue single breasted, Nehru collared, Prince Albert-cut coat; matching trousers; white gloves; belt and night stick. Rental Item. $84.50 each. #P0035. Hat with visor; shirt; tie; uniform jacket; trousers. Rental Item. $64.50 each. #P0180. Black hood with eye slits; black tights; boot tops; gauntlet gloves. Costume is worn bare chested. Rental Item. $54.50 each. #F5202. Riding boots instead of boot tops. Rental Item. $21.50 per pair. #P0210. Blue uniform, long sleeved shirt; white T-shirt; blue cotton chino trousers. Rental Item. $45.50 each. #P0200. Fireman helmet; black slicker. Rental Item. $64.50 each. #P0220. Old-time fireman helmet; red shirt; black trousers. Rental Item. $64.50 each. #P0230. Fire resistant, silver attire: Helmet; coat; trousers; gloves. Rental Item. $64.50 each. #F5170. Fireman’s hip boots. Rental Item. $37.50 per pair. #P0260. Theatrical version of French policeman. Pill box hat with visor; tunic jacket; uniform trousers; belt; short cape; nightstick; gloves. Rental Item. $84.50 each. #R5080. In cotton or rayon. Rental Item. $42.50 each. #R5090. In velvet. Rental Item. $64.50 each. #R5073. Long, red, judicial robe with white faux fur trim. Rental Item. $84.50 each. #P0400. Uniform hat with badge or emblem; shirt; black four-in-hand tie; coat with badge; uniform trousers; belt, holster and nightstick. Rental Item. $84.50 each. #P0420. Uniform hat with badge or emblem; blue or white uniform shirt with badge; black four-in-hand tie; uniform trousers; belt, holster and night stick. Rental Item. $74.50 each. #P0440. 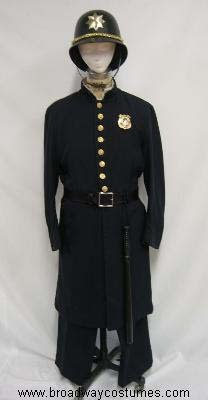 Uniform hat with badge or emblem; shirt; black four-in-hand tie; coat with badge; navy blue skirt or trousers; belt, holster and nightstick. Rental Item. $84.50 each. #P0460. Uniform hat with badge or emblem; blue or white uniform shirt with badge; black four-in-hand tie; navy blue skirt or trousers; belt, holster and nightstick. Rental Item. $74.50 each. #B5255. Police belt. Rental Item. $8.50 each. #B5265. Sam Browne belt. Rental Item. $14.50 each. #B5630. Faux walkie-talkie. Rental Item. $6.50 each. #C5335. Wood night stick. Rental Item. $5.50 each. #C5785. Leather police coat without badges. $52.50 each. #V5008. Bullet vest. Rental Item. $29.50 each. B5605. Leather handcuff holder. Rental Item. $2.50 each. #B5615. Leather key ring. Rental Item. $2.50 each. #B5620. Mace holder. Rental Item. $2.50 each. #B5625. Night stick holder. Rental Item. $1.50 each. #H5074. Gun holster. $8.50 each. #P0480. Uniform hat with visor; shirt; tie; coat; trousers. Rental Item. $74.50 each. #P0500. Uniform hat with visor; shirt; tie; trousers. Rental Item. $64.50 each. #B5030. Leather bag. Rental Item. $37.50 each. #P0540. Campaign hat or brown uniform hat with visor; tan or beige shirt; dark four-in-hand tie; brown jacket with badge; uniform trousers. Rental Item. $74.50 each. #P0280. White painter’s cap; white coveralls. Rental Item. $42.50 each. #P0320. Little white lace headdress; black satin dress (some with sequin trim) with lace trim at neck and sleeves; petite white apron; dance trunks. Rental Item. $54.50 each. #P0340. Mob cap; white or black high necked and long sleeved blouse; neck bow or ribbon; black floor-length skirt; petticoat; pinafore. Rental Item. $64.50 each. #D5060. Black and white feather duster. Rental Item. $8.50 each. #P0350. Denim or navy cotton twill overalls; baseball cap. Rental Item. $42.50 each. #P0140. White laboratory coat; white uniform trousers. Rental Item. $42.50 each. #P0580. Surgical cap; mask; green surgical gown. Rental Item. $42.50 each. #P0570. Two-piece scrubs (pullover top and matching drawstring trousers) in assorted colors. Rental Item. $42.50 each. #B5020. Doctor’s small Gladstone bag. Rental Item. $17.50 each. #B5022. Doctor’s large Gladstone bag. Rental Item. $23.50 each. #M5160. Mirror on headband. Rental Item. $2.50 each. #S5540. Stethoscope. Rental Item. $10.50 each. #T5358. Green scrub trousers. Rental Item. $13.50 per pair. #P0360. White cap; white uniform dress or pants suit. Rental Item. $54.50 each. #F5340. White institutional shoes. Rental Item. $14.50 per pair. Also see Civil War Nurse, World War I Nurse and World War II Nurse. #P0390. White or blue uniform shirt; navy uniform trousers; navy coat with patches. Rental Item. $64.50 each. #P0380. Knit cap or rubber rain hat; heavy black rubber coat. Rental Item. $54.50 each. #F5170. High rubber hip boots. Rental Item. $37.50 per pair. #P0520. Uniform hat visor and badge; colored or white shirt; four-in-hand tie; uniform jacket with badge; uniform trousers. Rental Item. $84.50 each. #P0560. 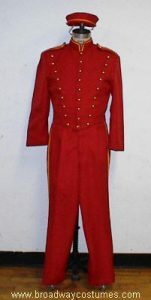 Turn-of-the-century uniform. Round hat with visor; uniform jacket with gold or silver buttons up to the neck and a Peter Pan collar; uniform trousers. Rental Item. $84.50 each. #P0583. Blue and white striped cap, coat and overalls or trousers; blue collarless or work shirt; blue or red neck bandanna. Rental Item. $64.50 each. #P0590. White shirt; bow tie; vest or short waiter’s jacket; black trousers. Rental Item. $54.50 each. #P0600. Small uniform headpiece; pastel colored or white uniform dress; small apron with pocket. Rental Item. $54.50 each. #P0610. In black. Small white uniform headpiece; uniform dress with white collar and cuff trim; small white apron. Rental Item. $54.50 each. #P0612. In green. Small white uniform headpiece; uniform dress with white collar and cuff trim; small white apron. Rental Item. $54.50 each. #P0614. In gray. Small white uniform headpiece; uniform dress with white collar and cuff trim; small white apron. Rental Item. $54.50 each.